NDS4iOS emulator is Nintendo or Nintendo DS emulator for iOS devices like iPhone, iPad, and iPod Touch. It enables iOS user to download and play different Roms of Nintendo Games. By the download process of NDS4iOS you can easily play the games that you desire on the emulator screen. First of all we have to download safari application and search “iemulator.com” in safari application. 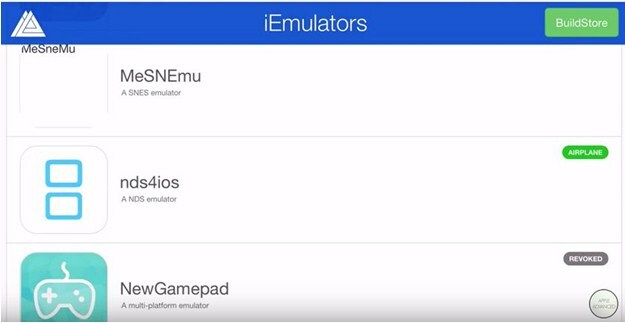 In iemulators find the nds4ios emulator application. There are 2 logos for nds4ios application. One with a blue color and another with a red color. You need to click on blue color logo application. Click on application which having blue color logo. After click on it, it will give a pop-up box for installing nds4ios like following. Click on install button. It will take a little time. Before starting of download go back to the home page for general settings. Go in general settings and click on date & time menu and turn off the “set automatically”. And set a date, which should be one year ago from today. After doing that the downloading speed of nds4ios will be increased. Once the nds4ios is installed in your system change back date and time from general settings and turn on the” set automatically”. Then go in general -> profile & device management -> enterprise app -> Fujian Ohm Software Co., Ltd.
After this process nds4ios emulator is successfully installed in your iPhone , iPad and iPod Touch. Once the emulator downloads go back to safari and visit “coolrom.com”. Find your favorite nds game and download it. You need to open the ROM files category. Scroll down to the Nintendo DS category. Here you can find different ROM game. Once you tap on game to download give it a little time before do other tasks. Now you will need to get the screen to come up which allows you to “Open in” on the left side. After tap “open in” choose the nds4iOS option from the share sheets. This will start download your game into the emulator. When you will complete these step the game will appear in emulator and ready to play. Simply tap on the game name to load it and start playing. The settings inside the emulator should be fine at default settings. Once the page is loaded, you will be able to see an ‘Install’ button at right side corner. Tap on install tab and NDS4iOS emulator will be downloaded automatically. Now go in the settings page and do the General Settings. From the general settings, select General and tap on device management. Now you will be able to see a profile named “Guandong Weking Group Shunde Electrical Appliance Co. Ltd“, just tap on trust and tap it again to verify. Step 1: Connect your iPhone, iPad or iPod Touch device with your PC/Laptop and open iTunes app. Step 2: Select your device from the navigation bar and go to the app section. Step 4: Drag and drop the .nds file of each game you want to play into the emulator onto the box under “nds4ios Documents”. Step 5: Return to the app, select the menu icon in the top-left lowed by the ROM List to find all the games you copied to the app. Now you can select your favorite game and play it. 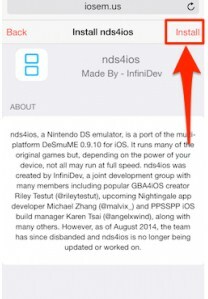 So, finally whatever iOS device you’re using, you can download and install nds4ios emulator for it easily using these useful steps.